Manchester United players and staff are already talking about Zinedine Zidane coming in as manager with Jose Mourinho not expected to last beyond September, according to the Daily Mail. United have endured their worst start to a season in over 25 years after losing two of their opening three Premier League matches with Monday’s 3-0 hammering by Tottenham at Old Trafford meaning they’ve conceded the most goals  after three games since 1969. It compounds a turbulent few months that have been overshadowed by talk of rifts between Mourinho and players like Paul Pogba, Anthony Martial and Eric Bailly while widespread reports claim the Portuguese coach is at odds with executive vice chairman Ed Woodward over the lack of top quality signings this summer. 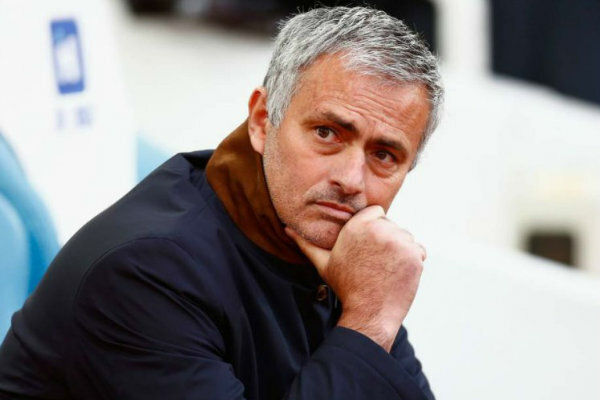 The pressure appears to be getting to Mourinho as he stormed out of his post-match press conference after the Spurs defeat demanding more respect from the media after reminding journalists that he’s won more titles than the other 19 Premier League managers put together. It’s led to speculation that Mourinho’s days at Old Trafford are numbered and the Daily Mail claims Manchester United players and staff are openly talking about when the 55-year-old will be sacked by Woodward. The newspaper says there is a sense of inevitability that mirrors the final days of Louis van Gaal’s reign and players are already talking about the possibility of former Real Madrid boss Zinedine Zidane taking over from Mourinho. A club source told the Daily Mail that some of the Man Utd players think Jose will be sacked if they lose at Burnley this weekend while others don’t think he’ll see-out September. ‘They are saying Jose will be gone soon. Some think he’ll be out if they lose at Burnley. Others can’t see him lasting beyond September. United have publicly backed Mourinho and there is little chance of him walking away but the report says the clubs hierarchy are disappointed with the managers inability to get the best out of his squad and they’ll be under increasing pressure to act if they suffer a third consecutive loss at Burnley on Sunday. It’s clear there are serious issues going on behind the scenes and some of the players are no longer giving their best for Mourinho with Pogba, Bailly and Martial just three players who are under-performing. Disgruntled fans plan to fly a banner over Turf Moor this weekend calling for Woodward to be sacked but the reality is it’s Mourinho’s head that’s on the block and the chances are he could find himself out of a job if results don’t dramatically improve soon. It is difficult to believe that Zidane (or any other manager of quality) would be willing to sign on at Man U. given the manner in which Mourinho has been undermined by Woodward. Ed woodward is Man. U’s major problem. They will never challenge for top spot while Woodward is in charge; especially now when EW has indicated that he knows better than his manager who should be signed or released to improve the team. Big mistake to stay with Woodward. Send him back to the gift shop. Woodward is the major problem and not Mourinho. If Woodward had agreed and bought experienced central defenders as identified by the manager, probably our season would have been better than we started. Unless there is a conspiracy to do away with Mourinho from Man Utd, he is at the moment very much in bright hope of doing great things for the club. Zidane left Madrid for similar reasons after winning the champions league for a third straight time. He too identified players to be bought, but club management thought otherwise, and today that is what Mourinho is experiencing at oldtraford. Again, Zidane is not a proven quality more than Mourinho in world football.